2 October 2018 | Centuries of unsustainable agriculture have squeezed massive amounts of nitrogen and carbon out of soils, and Ohio State’s Rattan Lal, a professor of soil science who has presciently spoken out about restoring forests and soils for carbon mitigation and sequestration, says we can pull about 10 percent of our greenhouse gasses out of the air and inject them into soils just by switching to climate-safe agriculture – a practice that could also increase farmers’ yields and save on fertilizer costs. 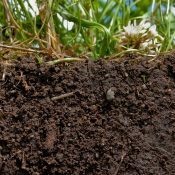 “Soil,” which better than “dirt” connotes the rich biodiversity and dynamic chemistry it houses, is finally getting the attention it deserves, both in mainstream media like the New York Times and in global climate talks, as the costs and benefits come more clearly into focus. This high ambition has engendered a push-back from quite a few soil scientists who believe that 4 per 1000, however auspicious, might be over-promising soil as a climate change mitigation and sequestration measure. These soils scientists welcome global efforts to improve soil quality – and increased carbon content is central to bettering soils health – but they aver that sustaining the .4 percent increase over many years is too high in terms of soil ecology. They also point out that there are real economic challenges that need to be considered if soils are to emerge as an important climate mitigation and sequestration strategy as well as a promising global focus for sustainable agriculture. Nonetheless, soils, which fall within the advisory Intergovernmental Panel on Climate Change’s (IPCC) “Land use, Land-Use change, and Forestry” (LULUCF) category, can eventually become a cost-effective contribution to the Paris Accords goal of limiting global temperature rise to 1.5- 2.0 Centigrade degree increase relative to pre-industrial levels, even if not at the 4 per 1000 level. Natural resource economist Dominic Moran, who is on the faculty at Scotland’s Rural College (SRUC), has worked on the economics of climate mitigation for years, and he sees both hurdles and promise for large scale soils carbon sequestration. He points out LULUCF accounts for approximately twenty-five percent of global ghg emissions and there is no reasonable way to achieve the Paris Accord goal without addressing LULUCF. And, Moran says, carbon sequestration in soils is a promising LULUCF mechanism – even as a negative emissions technology, by which atmospheric carbon is pulled down into the Earth. “Because there is a lot of soil in the world and a lot of it can be improved, there is a lot of abatement potential,” says Moran. This points to the role natural resource economists will play to make soils sequestration viable at a large scale. In the meantime, soil ecologists are offering central economic as well as ecological considerations, which natural resource economists can follow and provide fuller guidance. Powlson says an impetus of his Global Change Biology paper was that he and other soil scientists were concerned about hopes raised by the 4 per 1000 mil initiative. So Powlson and colleagues looked at their long-term experiments to assess the carbon soil increase rate in connection to land management. They found that in general soil carbon does increase but generally reaches a plateau, after not a long time. Increasing the manure distribution on land is obviously challenging (e.g. storing and transporting large amounts) but it can also bring about nitrate leaching and phosphorus pollution. The release of the potent nitrous oxide ghg also comes with manure deposition. Most fundamentally, transferring carbon from manure to soils does raise soil carbon content and brings about important benefits for agriculture, but it transfers existent carbon between stocks, so the mitigation benefits are questionable. However, letting crop residue reside in soil instead of burning it – one much highlighted soil carbon measure – is a clear mitigator on balance. Other measures such as no-till, are, on balance, true mitigators. Another recent study on tropical soils, “Soil carbon stock changes in tropical croplands are mainly driven by carbon inputs: A synthesis” in the March 2018 issue of Agriculture, Ecosystems and the Environment” was similar to Powlson’s European Rothamsted study in cautioning of overpromising on soil for carbon concentration abatement, but did mention significant soil carbon retention potential through enhanced crop rotation, with particularly strong carbon retention in the root zones of rotated crops systems. Fundamentally, Powlson hopes that increasing soil carbon could be appreciated as a Sustainable Development Goal (SDG), pointing to understandings articulated by Canadian soil biochemist Henry Janzen, that it is the unique relationship of soil carbon and microorganisms who break down carbon in soil that gives soil good and porous structure, all the while transferring the suns energy captured via photosynthesis into the below ground earth, all plusses for agronomy. Colorado State University soil ecologist Keith Paustian, who specializes on soil carbon and also soil carbon monitoring, agrees with Powlson that increased sequestering carbon in soils can never be the central mitigation program and cannot offset fossil fuel emissions. However, Paustian remains bullish on soil carbon and feels it is a very promising component in an abatement portfolio for the future that would combine reducing emissions with measures to draw down atmospheric carbon . “There is a lot of land area where you could practice better land management practices and get benefits,” says Paustian, adding that existing conservation practices, such as cover crops and crop rotations, are effective. He adds that there are not technological barriers to increasing soil carbon. This future landscape would include breeding crops for deeper, more efficient carbon storage to supplement the conventional and well-supported breeding that focuses on yield increases and pest resistance. “In order to do things differently…that requires additional investment, but I think probably the breeders could do a lot on something they have not been asked to do,” says Paustian. Inevitably, farmers will be asked to change practices, adding expenses to their already stretched account balances. It won’t be easy, but it is possible. “Farmers for many of these practices are going to need incentives at least to get the ball rolling. It is not going to happen by itself ; it will have to be incentivized,” Paustian adds. As an economist, Moran, too, is quite attentive to what farmer will do for soils health. He agrees with Paustian that policy incentives will be needed. There will also be behavioral challenges that industry psychologists can help with. “These are about four hurdles we probably have to step through to make sense of how much abatement we are actually going to get from soils,” Moran says. Moran also adds three other major refinements are essential for soil carbon economics. First, property rights need to be tweaked or transformed to promote soil carbon. He explains: “Governments have been changing property rights in the U.K. and United States for last several decades, making farmers do more things which is subtly changing their property rights to their own land water pollution. We need that to pervade carbon emissions.” Moran adds that this raises questions of how fast can you change legal rights. But it can be done, with carrots and sticks, which resource economists and psychologists can help with. Additionally, Moran says much more work needs to be done on monitoring carbon and soils and emissions from land, and this will be hard but necessary. It is a technical area that Paustian works on, which both Moran and Paustian feel is improving, but more research and development and more consistent monitoring, especially on farms, are essential. Currently, agroforestry is way ahead of soils in terms of MRV, monitoring, reporting verification. Finally, Moran says “the other big glaring elephant in the room that would make this happen is global carbon pricing.” But in the meantime, there are other incentives for other public goods that could serve as models for moving the economic incentive for soil mitigation forward, like programs for wetlands mitigation and low grazing. Moran adds one idea is to reform agricultural subsidies to include carbon and another idea is to get more buy-in from the private sector on this would be a start. Richard Blaustein is a freelance journalist focused on science, the law, and the environment. He is based in Washington, DC.